Enterprise Environmental Factors (EEF) and Organizational Process Assets (OPA) are the inputs of the project integration management processes. These concepts have an extensive coverage in the PMBOK Guide. Both concepts are easily understandable however many PMP aspirants have difficulty to understand. 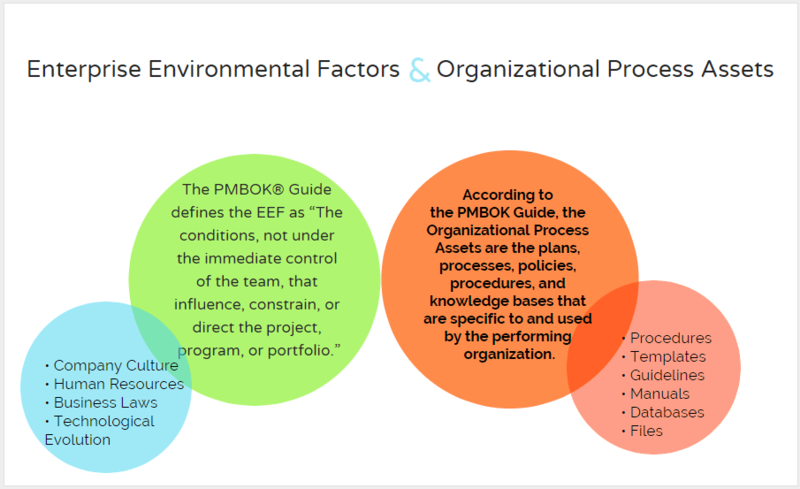 Enterprise Environmental Factors (EEF) and Organizational Process Assets (OPA) are important concepts for project management processes. Therefore you must understand both concepts to pass the PMP Certification exam. Maybe you will not encounter questions during the exam directly related with them but knowing both concepts provides a better understanding for other project management processes. In this article we will discuss both Enterprise Environmental Factors (EEF) and Organizational Process Assets (OPA) concepts and the key differences between them. What are the Enterprise Environmental Factors? Environment can be everything living or non-living around us. Physical, natural and chemmical things, conditions form the environment. So that it has the impacts on humans and projects. For example weather conditions such as excessive precipitation or blowing snow slow down a construction project. In this example severe weather conditions are the environment which has negative effects on the project’s performance. The enterprise environmental factors have effects on the projects, organizations and project teams. It can be classified as internal EEF and external EEF. What are the Organizational Process Assets? Assets are useful or valuable things, inventories that an organization or an individual owns. For instance manufacturing machines are the assets of a pharmaceutical plant. Or your computer that helps you to connect internet is your asset. Assets may also be templates, procedures, documents as well as manufacturing machines or computers. Organizations use assets while performing their businesses. So they are called the Organizational Process Assets. According to the PMBOK Guide, the Organizational Process Assets are the plans, processes, policies, procedures, and knowledge bases that are specific to and used by the performing organization. In orher words, The Organizational Process Assets are the properties of an organization which help the organization to achieving it’s goals. Organizations create templates, contracts, registers, forms, plans in order to conduct project management activities. The Organizational Process Assets represent the company’ s know-how. The Organizational Process Assets can be classified in two categories. The first category includes policies, procedures and templates that help an organization to conduct works. The second category includes records and archieves related with the past projects. Risk register, stakeholder register, methods, historical records etc. The Organizational Process Assets involve very important project documents that help an organization to become more efficient. For instance let’s assume that you will create a stakeholder register for a new project. Fist thing to do is to check the previous project’s records related with the stakeholders. You will customize the stakeholder register template for the new project and obtain the list of stakeholders on the same location. This will save your time and prevent you to miss the important stakeholders. As discussed above, Enterprise Environmental Factors (EEF) and Organizational Process Assets (OPA) are two different concepts. Below are some of the differences between them. Since the Organizational process assets are the organization’s inventory and documents that can be changed or modified. On the other hand, enterprise environmental factors are the conditions mostly out of the organization’s control such as government regulations. Improving the organizational process assets improves the processes of an organization. On the other hand enterprise environmental factors may have positive or negative effects on a project depending on the conditions. Organizational process assets support the organizations efficiency and continuity. By the help of organizational process assets, the organizations improve their process and increase their productivity. Organizational process assets are related with the organization’ s outputs and product quality. Enterprise environmental factors may have positive or negative effects on an organization. Internal enterprise environmental factors are under control of the project management team but external enterprise environmental factors are not. Enterprise environmental factors are related with the organization’ s structure and the market. Enterprise environmental factors may limit the project team. On the other hand organizational process assets improve the teams work and help to save time. Enterprise environmental factors are mostly out of your control such as political climate or a change in tax rates. However effective planning and control practices help to improve decision making so that you can minimize the negative effects of EEF by early responses. On the other hand organizational process assets are the records and knowledge base of an organization that have influences of the organization’s success. Keeping and storing the records systematically make the project’s team’s work more efficient. In this article we review both enterprise environmental factors and organizational process assets concepts. Note that these concepts are important from the PMP Certification exam point of view because they are related with project integration management processes.